Week 5 in the NFL is now only 2 days away, and as always, I’m stoked and ready for some football. I’m also ready to give you the key match-ups for this week. First match-up -- The Kansas City Chiefs heading to Indianapolis to take on the Colts in what promises to be a classic. The Chiefs are red hot right now and are looking to continue their winning ways and move to 4-0 with a win over the Colts. They have a couple things working really well for them right now: they currently have the 5th best rushing defense in the league, holding their opponents to 75 yards per game, and they also happen to have the 3rd best rushing offense in the league averaging just over 161 yards a game. What does that mean for the Chiefs? Well, I think it means a lot considering the Colts don’t have much of a running game right now; it also means they should have no problem running the ball, seeing that the Colts rushing defense is giving up nearly 150 yards per game. 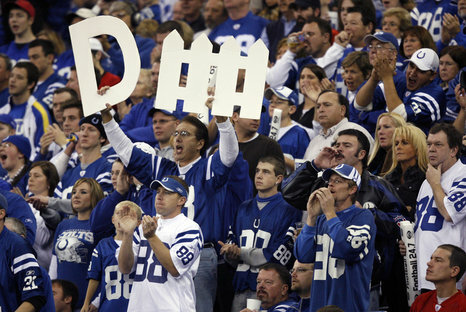 However, the Colts have something working for them as well, and that something is Peyton Manning. Manning is no doubt an absolute monster, and should have another beastly game -- the only issue is that he’s got to start getting some help from the defense. The Colts are averaging 335 passing yards a game, but whether or not Manning throws for 400 yards every game and throws 5 TD’s, their defense still has a job to do, which is to keep the other team from scoring more points than you. So far, the Colts have only managed to do that twice this year. This should be a fantastic game, and although the Chiefs look better on paper, I believe the Colts will win this one and hand the Chiefs their first loss of the season. Final score, Chiefs 27, Colts 35. Second match-up -- Brett Favre taking on his former team for the first time since retiring from the team 2 years ago, and doing so in the Meadowlands. Should be a Monday Night Football classic and one that could set (or unset) the stage for the rest of the season. The Vikings need this more than the Jets, and are still in a must-win situation. The Vikings have one of the most balanced defenses in the league right now, allowing an average of only 189 passing yards a game, 87 rushing yards a game, and giving up only 12.6 points a game. The problem is that in their two losses they have a scoring average of 9.5 points per game. You can’t make it in the NFL if you’re only scoring 9.5 a game. The Jets on the other hand are averaging 26.5 points a game and holding their opponents to only 15.2 points a game. The Vikings are 5th in the league in rushing yards with 143 yards per game, while the Jets have the 4th best rushing defense in the league allowing only 75 yards per game. Those stats alone may be key factors as to why the Jets win this game. My head tells me that because of what’s on paper, the Jets win 28 to 17. However, my heart (and the fact that Randy Moss is back in Minnesota) tells me different. Final score, Vikings 27, Jets 24.